Here's a mostly non-baseball post, although it's good to see the lead back up to 8 games after taking 5 of 7 on a trip through Cleveland and Tampa Bay. - J.J. Abrams made the first casting announcements for the new Star Trek movie, announcing Heroes bad guy Zachary Quinto as Spock. It's a great casting choice. 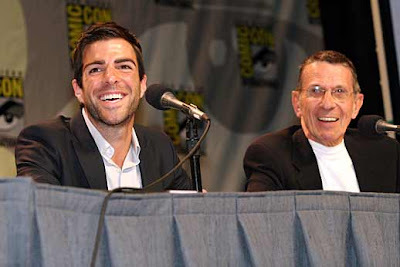 Based on what I saw in Heroes, I can easily see Quinto getting the whole Vulcan thing right. Leonard Nimoy will also be appearing as "Old Spock". Abrams wants Shatner to appear as well, but he's apparently having trouble getting around that thing in Star Trek: Generations where Kirk died. - I missed out on the Vintage Base Ball Federation playoffs in Westfield this weekend because we took the kids on a long promised trip to the beach. We headed down to Narragansett, RI and went to Sand Hill Cove, where we had a wonderful time. For dinner last night, we crossed the Pell Bridge and headed to Flo's Clam Shack and pigged out on a thoroughly unhealthy but delicious combination of clam cakes, fried clam strips and clam chowder. We followed that up with a visit to Newport Creamery for ice cream. Considering that we had Del's frozen lemonade at the beach, if we had only managed to have some coffee milk, we would have had all the major Rhode Island food groups.